Size: Toddler (2/3), Color: Brown is currently out of stock! Super deluxe authentic child's costume! Got the need for speed? 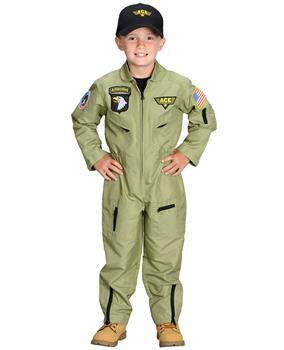 This Jr. Air Force Pilot Suit will take the kids from the playroom to the flight deck in one easy outfit. Includes: one-piece design jumpsuit loaded with lots of zipper pockets, Air Force custom patches, and Air Force style hat.